Somewhere, deep in the heart of the city, a villain perfects his nefarious plan. His constant obsession: to rid the city of its pesky patron saint and to finally rule the weaklings that walk its streets. Meanwhile, high atop the tallest skyscraper, a hero watches, his razor keen senses attuned to the slightest stir of trouble. The hero knows that it won’t be long before the villain emerges from beneath the urban sprawl – and wherever evil rises, the hero will soon strike it down. The setting: the colorful city of Gold and Silver Age comics – the world of Super Showdown! 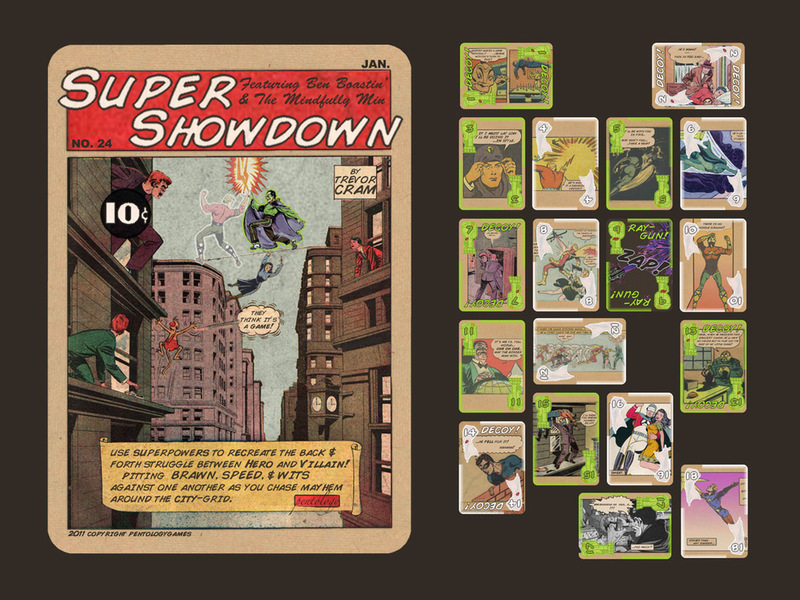 Super Showdown is a card game that pits two players in the classic struggle of hero versus villain in the world of classic comics. The rules are pretty simple to grasp, but allow for a surprising amount of depth for such a small game. 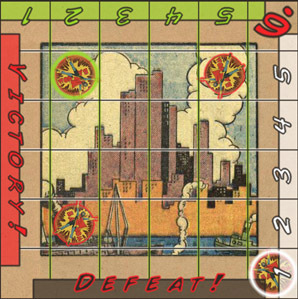 Players are dealt 9 cards each which have a color (either white for a heroic card or green for a villainous card) along with a certain number that determines that card’s power. If you have more white cards in your hand, you’re the stalwart hero – if not, you’re the nefarious villain! The city board - small, but mighty. Players then place their hero or villain tokens on the start space on the board and get ready to dash and bash. Each round, the start player rolls their color die and places it next to the corresponding number and color around the board. They can then move up to 2 spaces (3, if they begin the turn on a Powerboost space). Each player then chooses one card from their hand and places it face down on the table; this card will be used later in the Showdown. The second player then rolls their die, places it around the board, and moves. The location where the two dice that were placed as markers intersect indicates where Mayhem occurs in the city. This is sometimes used to determine what type of Showdown takes place. BRAWN: If the Hero and Villain tokens occupy the same space in the city, then the nemeses duke it out hand-to-hand. When cards are revealed, the card with the highest power number is victorious. It is placed in the Victory pile, and the other card is placed in the Defeat pile. HOWEVER (cue the sharp organ chord!) – if the Villain played a Ray Gun card, then the green Villain card wins, regardless of the number! ANOTHER HOWEVER – if the Hero played a Decoy card, then the effect is reversed and the Hero card wins! Oh, how sweet that can be. If the players duel with Brawn, both player tokens are returned to their start spaces at the beginning of the next round. SPEED: If one (and only one) player token is on the Mayhem spot, then a Speed Showdown occurs. Cards are revealed and the player whose token is in the Mayhem gets to choose which card is victorious. HOWEVER – if a player did not reach the Mayhem and played a Decoy, that player gets to choose the outcome. It’s a mind scrambler! WITS: If neither player can reach the Mayhem and they are not locked in a Showdown of Brawn, then a Wits Showdown occurs. Cards are revealed and highest power number wins. HOWEVER – if both cards are the same color, then their power numbers are added together. If the total is greater than 19, then both cards are placed in the Defeat pile! Oh, how devious. Once the Showdown is wrapped up, the player who moved last in the previous round rolls their die and moves first. Play continues until the Hero or Villian is victorious. And oh yeah, the goal! Each player can win Super Showdown in one of two ways: Get five of their color cards into the Victory pile, or five of their opponent’s cards into the Defeat pile. When I first opened up the review copy of Super Showdown from Pentology Games, my first reaction was “is this all of it?” The game only comes with 18 Superpower cards, a rule book, two reference sheets, two dice, two player tokens, and a teeny game board. However, after browsing through the cards with their classically-awesome art and digging into the inspired rule book, the game somehow felt bigger. After playing Super Showdown, that feeling only intensified. There’s a lot of depth here – much more than the components or concept belie. The constant press-your-luck mindgame that occurs with the play of cards is expertly coupled with precise (and simple) movement on the board. The real question comes down to that which many have to consider when it comes to Kickstarter projects – is Super Showdown worth the pledge price? 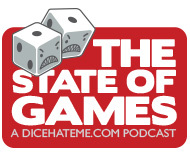 The base pledge is $15, which seems a bit steep for a game with so few components. However, taking shipping into consideration, the game comes out to about $12. 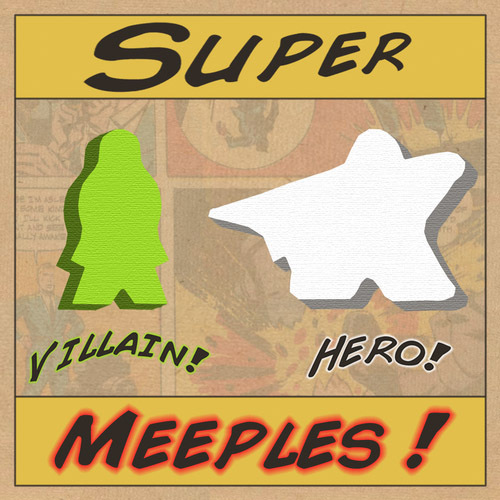 The game now includes Super Meeples in place of the colored game tokens to represent the Hero and Villain, which is a great, thematic touch. Overall, with the quality and depth of gameplay – especially for a two-player game – combined with the excellent and atmospheric artwork, I can safely say that Super Showdown is a great deal for your Kickstarter dollar. Join the fight – pledge to Super Showdown today and help Pentology Games get a higher print run. Better pricing, better quality, and, in the long run, a better company. It’s the Kickstarter way! It looks interesting. I thought there would be more smacking and less guessing /bluffing though. Still, I like the art and you can’t go wrong with a superhero theme.